This model was DCC ready when first released and was then later released as DCC equipped and DCC/Sound equipped. Currently (November 2016) its not in the catalogue but the last few are available from some dealers and the second hand trade for them is healthy. It’s fairly well documented that Bachmann has had a rash of gear failures with many of their models with the gears splitting so they spin freely on the shaft. Less well documented is that the splitting also affects the UJ’s on the Shay and the Climax. The internet was full of angst against Bachmann for a while as their initial reaction was to deny there was a problem and wouldn’t (couldn’t?) provide spares. So, what was the problem? 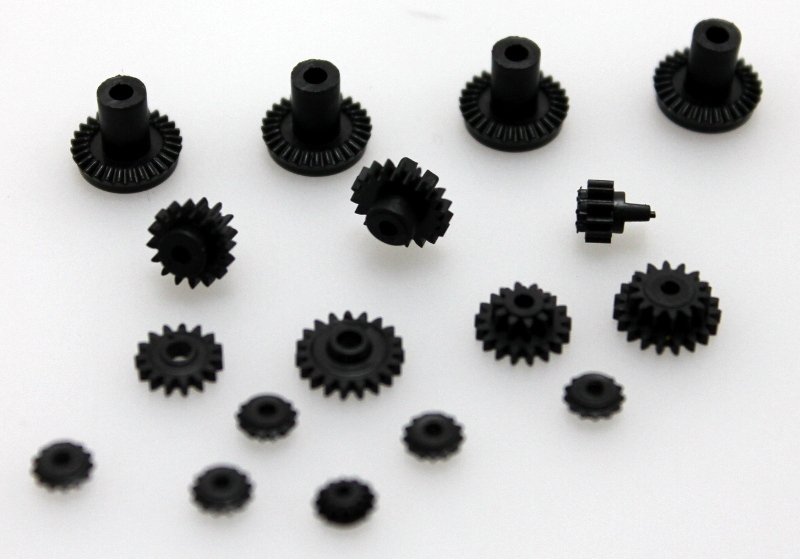 All the gears are injection moulded in an engineering plastic and the mechanics and chemistry of getting plastic to flow into moulds is a major science so I’ll try to keep it simple with just a couple of points. 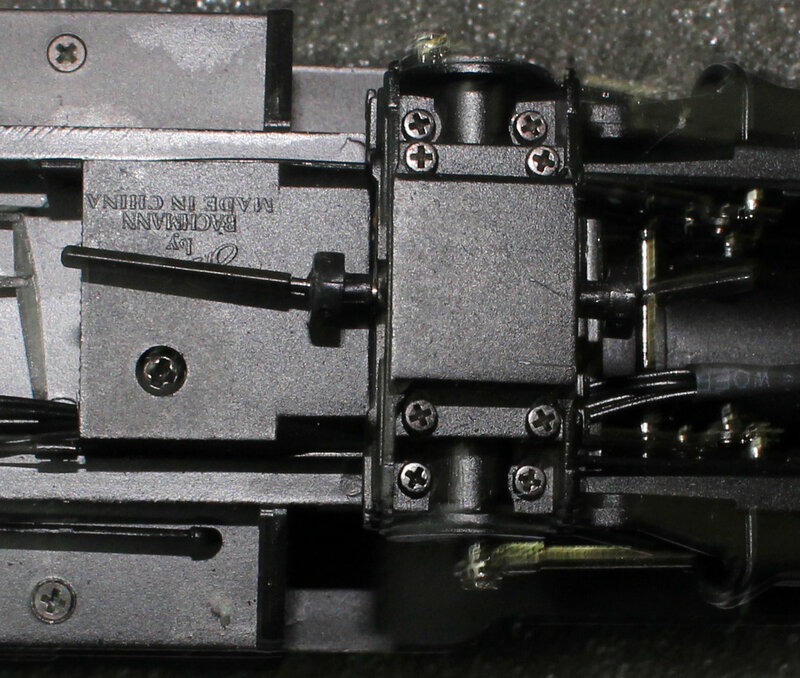 When you squirt molten plastic into a mould with a combination of temperature and pressure the plastic will flow around the mould and at some point, the two ends of the flow will meet and will have to fuse together. 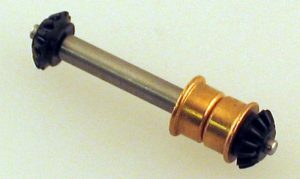 In a small gear, it will have flowed around the pin that forms the shaft hole and met on the far side. No matter how fluid or well fused the plastic is this point forms the basis of a fault line. 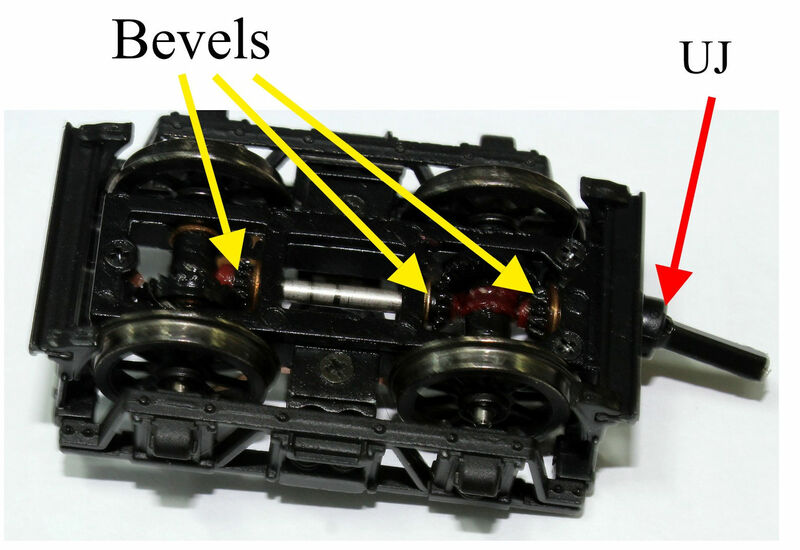 It seems that Bachmann had a batch of gears that were more susceptible to splitting than previously and this was across a range of models. It could be something as simple as the temperature was a bit low, or the plastic recipe was slightly different from previous batches. Affected models don’t have to be running and can fail in the box as the same forces are present whether its in use or not. 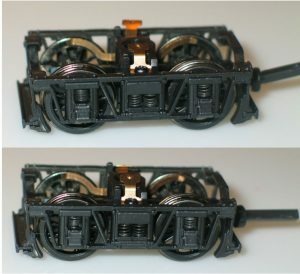 For the Shay, with Bachmann apparently in denial, NWSL produced metal gears for it but there are no metal gears for the other loco’s. Why? Because Bachmann eventually admitted there was a problem and produced replacement gears which, initially at least, were available FOC. This removed any commercial incentive from NWSL, or anyone else, to produce a metal alternative. Anyway, your Climax is fixable, so enough of the waffle and let’s get to fixing it. 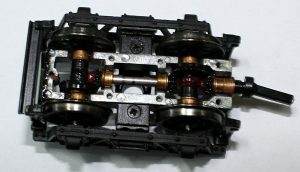 HAS THE ENGINE GOT SPLIT GEARS AND/OR SPLIT UJ’S? Pull the trucks off. Not as destructive as it sounds. They are retained on fixings akin to press studs. 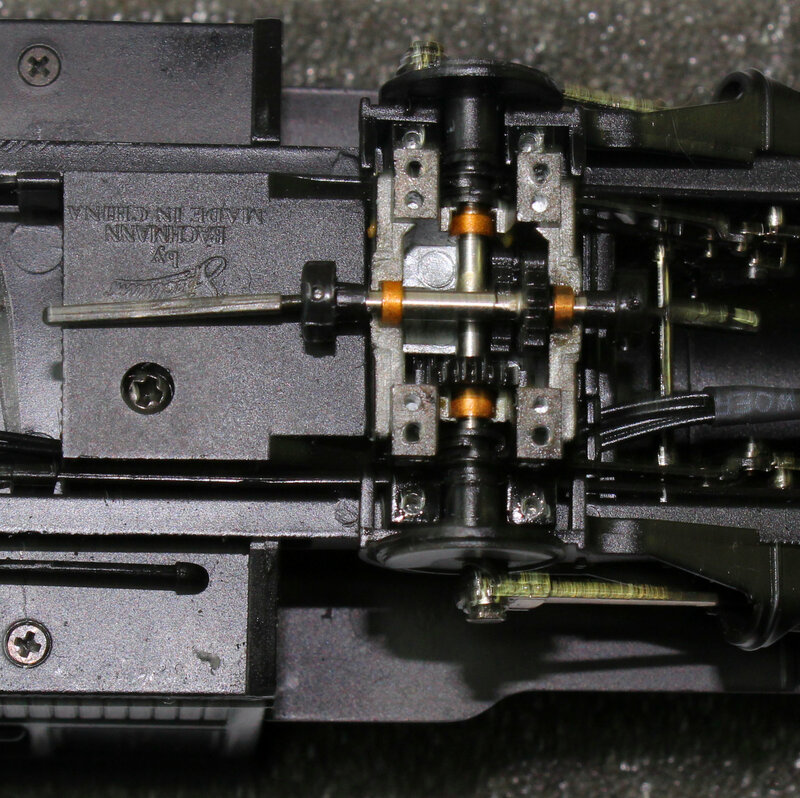 If you pull them down, they unclip and then move them towards the end of the loco so the drive shafts disengage. On each truck turn the drive shaft holding both axles so they can’t rotate. If the shaft rotates you have a split UJ and/or the bevel on that shaft has failed. Hold one wheel at a time and turn the shaft. If the shaft turns, and didn’t above, you have split bevel gears. 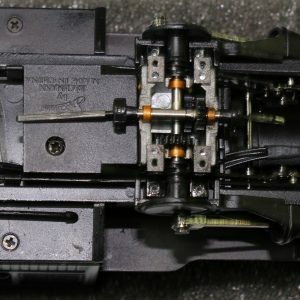 If you are an able and skilled modeller or just plain mean and think that Bachmann should repair your engine for free there is one course of action. If you have basic skills with a screwdriver, can work logically and are prepared to give it a go for a modest outlay path 2 is for you. If you just want an easy life and are happy to throw money at the job then path three is for you. For this one you also need to know that the UJ’s on the loco are OK. If they’ve failed have a look at path two. I’ll deal with them in reverse order but first we have to talk about getting the bits. In the USA Bachmann have a good online presence and their website includes a parts shop that features most of the parts you would need for the 0n30 range although some are out of stock. The US store is quite happy to ship to the UK. In the UK you can contact Bachmann Europe and see what they have but as the 0n30 stuff isn’t one of their primary ranges the parts stock is limited. If you ask them for Climax gears you will get a bag of bits and be following path one. http://www.bachmanntrains.com will get you to the Bachmann USA home page whilst http://estore.bachmanntrains.com/index.php?main_page=index&cPath=66_71_128 will get you to the Climax pages. It’s worth registering an account with the parts shop so they have your e-mail address. The reason it’s worth it if you’re prepared to play the long game is that once they have your e-mail address they send you special offers. These usually happen around US public holidays and are something like 20% off parts orders. Buy replacement trucks. All you have to do is clip them onto your loco. Of course if you have modified or weathered your originals you’ll have to do this again. To change the parts in the truck slide the brake cross beam out f rom the end where the UJ is. You just ease the brake shoes apart. Then undo the three screws that hold the keeper plate on and remove the keeper plate. Note which drive shaft the truck has, Short one on the front truck and long one on the rear. Lift out the center spindle with two bevels on and replace it with the new one. 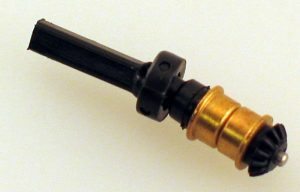 Likewise with the correct UJ shaft. Refit the keeper plate and the brake beam. Give the UJ a turn to check its all OK. If it is run it up and down your desk on its wheels a time or two. This spreads the grease and runs the gears in a bit. If you’re not doing the body UJ’s you can refit the trucks. If you need to do the body UJ’s invert the loco in some sort of supporting cradle and remove the eight screws you can see in this view. Keep the screws safe. Lift the gearbox cover off. 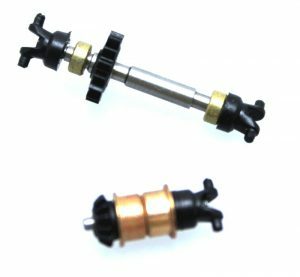 Lift the uppermost shaft out of the gearbox noting the orientation of the square drive shafts outboard of the UJ’s. They’ll probably fall off the shaft or, at least, need very little effort to remove them from the shaft. As the new shaft comes with half UJ’s fitted you need to tease the old ones out of the shaft UJ. The band around the outside is a flexible rubber ring which you can carefully pries off the old shaft UJ and tease the new one in (it takes longer to write it than it does to do it). With the square shafts and UJ’s mounted on the new spindle fit the spindle back in the gearbox. Add grease and put the lid back on with all eight screws. Refit the trucks and you should be good to go. If you’re mean or just got the free bag of gears what you have on your bench is a pile of gears most of which you won’t need. Follow method two but once you have the defective shafts removed from the trucks pull the split bevels off, if they haven’t already fallen off, and press the new ones one. Make sure you get them on the right distance up the shafts. 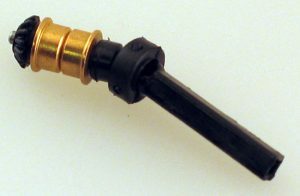 This pictures of the assembled parts may help showing how much the shaft should protrude as with them splitting they will have lost their register. Some trial and error may be necessary. A mix of one and two. For an easy life I have done more by method two but then used the gear pack in method one to refurbish the failed parts ready for the next one. None are essential but on my sound fitted ones that have to work at exhibitions I have wired the trucks to the body with fine wires so they don’t rely on the wipers anymore. The sound fitted ones have keep alive capacitors fitted as well. STILL MORE THAN YOU WANT TO DO YOURSELF?